Empty filter cartridges for treating water: rechargeable using materials for the chemical-physical treatment of water. The empty P SX filter cartridges for water are rechargeable with bulk materials for chemical-physical treatment of water. The empty P BX (SOE-o ring 222) filter cartridges for water are rechargeable with bulk materials for chemical-physical treatment of water. 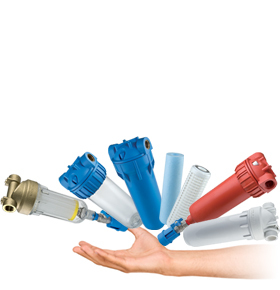 The P MIGNON SX empty water filter cartridges (DOE) are designed for specific MIGNON housing with 5”M height. The empty P S SX water filter cartridges with sponge can contain different types of filter materials. The empty P S BX (SOE - o ring 222) water filter cartridges with sponge can contain different types of filter materials. The empty P S MIGNON SX (DOE) water filter cartridges with sponge are designed for specific MIGNON housings, 5”M height.